Our marble products are meticulously handpicked for quality and beauty. 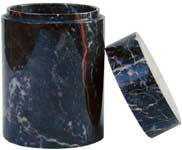 All marble boxes are made from natural stone formations and will vary in grain and color. These are truely beautiful pieces and each one is unique. 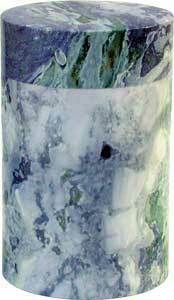 Elegant and decorative marble box in beautiful shades of light celadon green with jade & soft grey highlights. Makes a great gift for any cigarette smoker. Many of our customers use these as unique stone gifts. Aside from using it to store cigarettes, use it for storing jewelry , precious possessions or as a trinket box. Comes handy as a furniture accent or a decorative piece. You may use it as a unique ginger jar or fill it with your special jam for gifts. Polished finish. 4.50" x 2.75"
vary in grain and color. 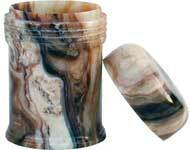 use it for storing jewelry , precious possessions or as a trinket box. Comes handy as a furniture accent or a decorative piece. You may use it as a unique ginger jar or fill it with your special jam for gifts. Polished finish. 4.50" x 2.75" 4.50" x 2.75"
Elegant round marble box in rich brown shades with a polished finish giving an overall petrified wood-grain effect. Makes a great gift for any one. Looks great in any room. This beautiful box in very light to medium shades of honey with veining of light alabaster giving an overall beautiful effect. Makes a great gift for any one. Looks great in any room. 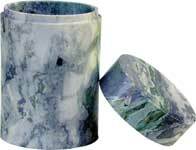 These marble boxes are meticulously handpicked for quality and beauty. Marble boxes available in many sites are made of different colors of commonly available and not particularly distinctive marble. There are some made of faux marble, composites, or man made marble materials with some small percentage of real natural stuff. 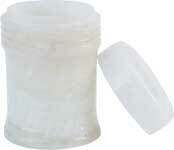 The problem is most of these sites still price them similar to the real genuine marble or stone or even higher. Our Boxes are made of natural stone formations particularly selected with distinctive and beautiful markings. These stones are cut precisely to the right sizes and polished to perfection. They are then hallowed with precision to within 0.25� thick walls. The lids fit so perfectly that it is hard to feel where the lid fits over the body. These are beautifully made boxes and can be used for many applications such as for jams, storage, jewelry, gifts, small urns, etc.